This is not a typical book from Allen and Unwin as it is pitched more for the mass market and not likely to win literary awards. 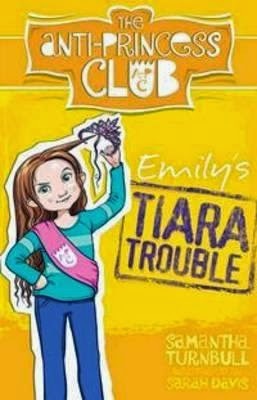 As its series title The Anti-Princess Club explains, Turnbull’s stories are pitched at girls aged 7 to 9 years in an attempt to help create a new generation of feminists -- a worthy endeavour! Each of the stories is narrated by ten-year-old Emily Martin who writes about the ordinary adventures of herself and her three friends, Bella, Grace and Chloe. Unlike the sort of girls their parents seem bent on raising, these girls are not interested in being ‘princesses’ but are more interested in geology, mathematics, science and athletics. Each of them has current and future life ambitions. Emily, for instance, wants to enter the district athletics’ carnival but her beautician mother instead forces her instead to do ballet. Oh that a child’s problems could be so easily solved! The motives behind this story are admirable, but the plot and the characters seem contrived to suit the author’s intentions. The writing is easy to read and the book is likely to be enjoyed by the average girl reader.